Hello lovelies, so before I talk about how gorgeous these cakes were from Caketoppers I thought I would let you all know what we've been up to. So we had a gorgeous week in Belamadena as I mentioned in a previous blog post, we had the most amazing week but as soon as I came home I become so ill, I have been bed bound for three days which meant I missed out on Oscar's birthday treat to Drayton Manor that I wanted to film and keep for him, which also meant I was so ill for his birthday too! I felt like the shitest mum alive honestly! I've never cried so much this weekend due to being ill and feeling like the worst mum for making Oscar have a crap birthday, although Oscar said it was the best birthday ever bless him! Dan has the worlds worst feet from holiday and has been walking around like Tina Turner but saved the day and took Oscar to Drayton manor thankfully and Oscar was at school most of the day Monday and I did push myself to go into town and let him pick his own birthday cake and now I'm feeling better we can finally play with all his new toys! 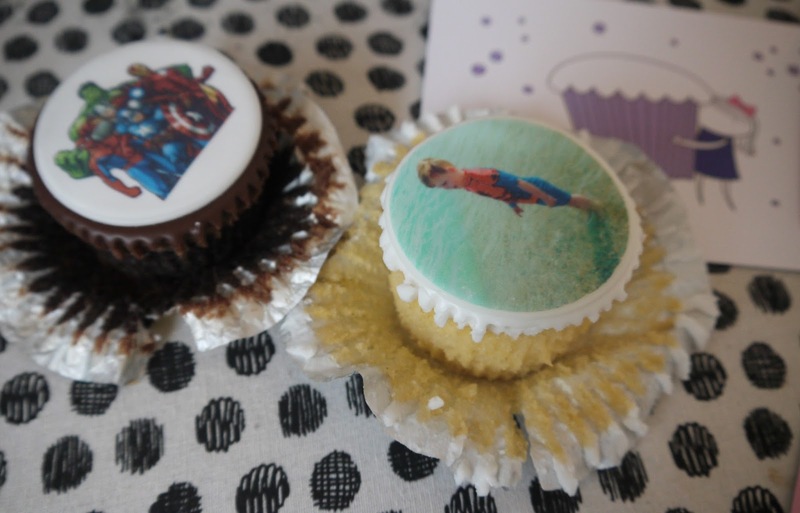 Another thoughtful thing about Caketoppers, I literally emailed them with 3 days to spare of being Oscars birthday and they got the cakes here a day before his birthday! I was so pleased about this, I loved the picture of him on the beach and I couldn't leave out his favourite superheroes obviously! They came freshly wrapped, in cute little silver and gold cup cake cases and they tasted amazing! I know everyone hates this word.... MOIST but they were really fresh, light and moist, they melted in your mouth but I have to say I'm more of a fan of the original sponge with the white icing than the chocolate, the chocolate one was a bit to sickly for me but it was Oscar's favourite of the two. I'm not a big fan of icing either but the icing on the normal sponge I could stomach fine and really enjoyed it. 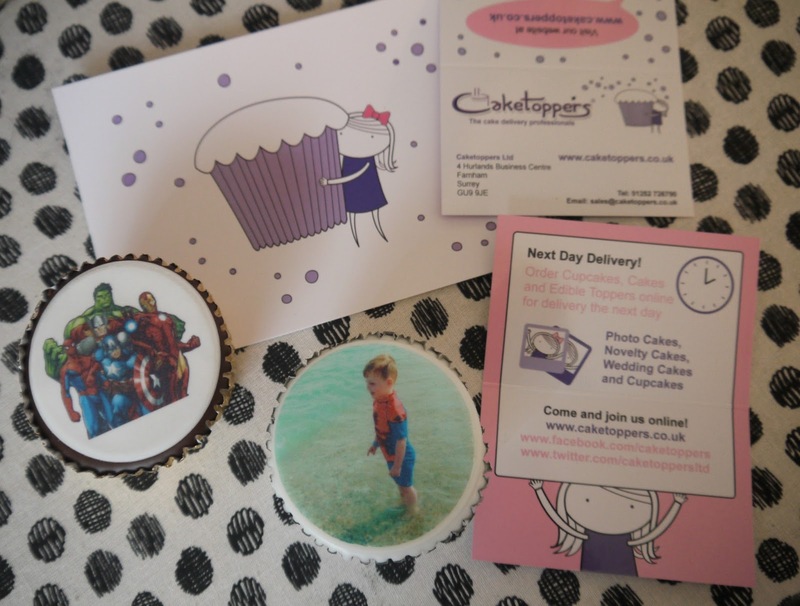 I very kindly got sent two personalised cupcakes at £5.95* each, they do great packages you can get 6 cupcakes starting from £12.99 with the same design or 6 cupcakes with different designs from £13.49. There is all sorts of options to choose from on their website. The cakes stay fresh for at least 5 days after delivering from then, due to the cases and packaging they come in provided. They are handmade using free range eggs and are experts in edible printing. 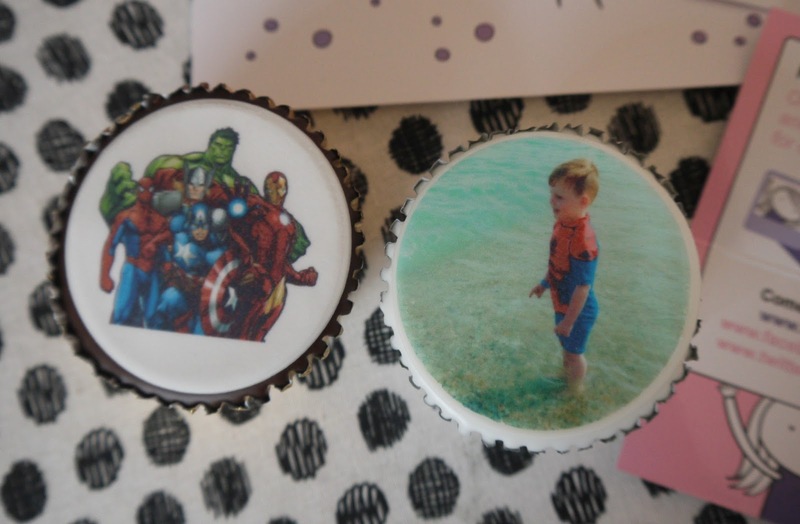 I would definitely order from Caketoppers in the future, its fantastic that they do next day delivery too, if you're like me and constantly forgetting things you could order some cute little cupcakes for someones birthday with even just a lovely or funny message on to brighten up someones day. I still can't believe my little well not so little baby at 9lb 7 is now 4 years old! It has gone way too fast, he has the worlds worst diva tantrums, he always thinks he's right and demands things but he is the funniest, most caring and loving little boy and he makes me so so proud every day, even the days I want to tear my hair out he comes out with the funniest things to brighten up my day again. He helps massively with his little brother and the chores and even walks the dog with me, he is independent, creative, clever and I can't wait to see what a four year old has in store for me! If YOU love cake as much as we do in this household you can get 10% off using this code - PPR10 enjoy. Beautiful girls, I know everyone wants more and more beautiful. Find a suitable dress,britishdress size 20 mother of the bride reviews there are many styles, here are beautiful and elegant dress,britishdress a line mother of the bride dresses reviews do not miss oh meet.If you need dress,I can give you a very cheap price.